Why hasn't ASU been better? from reviewing that list you would think that ASU should have been consistently ranked in the top 20 over the last decade. Obviously that is not that case but the question is why? From a closer look at the numbers we can see that ASU has been living off of the 96 Rose Bowl team for those numbers. 17 of those players were eventually drafted. Another group of 7 players during that time were recruited and signed by Bruce Snyder. that makes 24 of 38 players that were recruited and played under Snyder for their entire time at ASU. Leaving 14 players that were drafted after Snyder was fired. 11 of those were actually recruited by Snyder. That leaves an astonishing low number of 3 players that were signed and played only for Dirk Koetter. I do realize that close to a dozen of Koetter's signings still in the program that will be drafted over the next 4 years. Still under Koetter its clear the talent level dropped. One could argue from these numbers that Koetter was actually a very good coach just not a great recruiter. Snyder on the other hand consistently brought in talent; he was just incapable of consistently sustaining a big time program. I've posted this numerous times before, but it's an assertion that still pops up on message boards from time to time. It was a myth in 1997 and it's an infamous myth today: ASU played a prevent defense that led to Rose Bowl defeat and a loss of a national championship. Prevent defense by a strict definition is three down lineman, two linebackers, and six defensive backs. The down lineman shoot gaps while the linebackers and and DBs drop into a deep zone -- often times what's considered Cover 4, with the safeties and corners dropping way down the field. The theory is there's not enough time left for an offense to drive down the field, so create a scheme that all but eliminates the big play. As the saying goes, prevent defense prevents you from winning, and I don't necessarily disagree with that. - ASU had already been burned twice in good man coverage, once for a touchdown. - The depth at corner was not good, and Ohio State's bigger, faster receivers had worn out the DBs all night long. They were out of breath. What ASU employed was not unusual, and it wasn't even new to the defense. They had used some zones and zone blitz all year long. Dropping the backers into a medium net made sense, especially when you're trying to force a QB into throwing too short or too long. It accounted for part of their improved success in most every category that year. It was in fact working against Ohio State, but ASU could not get a stop on third down. Joe Germaine made three very good passes to convert on 3rd down three times on the drive. The touchdown pass from Germaine to David Boston showed exactly why ASU didn't want to throw a lot of bump coverage into the mix. ASU safeties were playing the deep inside, and freshman CB Courtney Jackson was playing an inside technique. They were taking away the slant. Boston showed inside and Jackson bit, then faded into no-man's land as Boston spun outside and caught a pass without a defender within three yards of him. Eric Allen's presence on YouTube is, thankfully, more watchable than Mike Haynes'. A short preview for a video entitled Eric Allen: Cornerback, the clip includes some great testimonials. Having Don Shula call you "one of the finest cornerbacks to ever play the game" is pretty special. Mike Haynes should have known better. You have to make it to around the 4:31 mark to see his contribution to this atrocity! For ASU, figuring out where to harvest football talent that will allow them to compete at an elite level has been a difficult task. ASU's history in the Pac-10 shows an almost schizophrenic change of regional emphasis -- even more often than the seven head coaches who have occupied the head coaching position for the program. When ASU has been most successful -- the two Rose Bowl years in 1986 and 1996 -- it has been predominantly California based, supported by strong Arizona recruits and/or strong juco personnel. The 1986 starting 22 featured: 14 from California, 7 from Arizona, and one from Michigan. What's startling was the lack of a single junior college transfer among the starters, but this was based on the strength of the early 80s classes Darryl Rogers' staff brought in. If I recall correctly, ASU landed what was regarded by some to be the No. 1 prep class in the country in 1982, highlighted by a dominance of San Diego and strong showings around the rest of California. The 1996 starting 22 featured: 12 from California, 5 from Arizona, 4 from nearby western states such as Nevada, Texas, and Idaho, and 1 straggler (Eazy Pat Thompson from Louisiana). This squad was scrambled from a lot of different parts, and included four juco transfers -- all on defense. - You have to own your backyard. That doesn't mean you take anyone from Arizona with a few accolades, but you definitely can't let five kids from the West Valley sign with Nebraska, and perhaps two of the most lauded Arizona recruits ever sign with USC. That wasn't the current staff's fault, but it's something they have to address immediately. - Texas is probably a mirage. Sure, it looks beautiful there with such an enormous state and loads of talent. But Texas already feeds all the numerous in-state schools as well as all the best programs in the Big 12 and Big 10. SEC schools have been known to successfully cherry pick there, too. ASU probably has to have a presence in Dallas and Houston, but they can't devote California resources to Texas (see the Marmie years). You probably treat west Texas like you treat New Mexico -- you only go there when there's probable cause. - The desert appeals to older folk. It's a more difficult sell to younger kids, even those in ice-and-snow country in the Midwest. We have a different culture, and we're still in a big city. And, of course, it's very hot here into October. You talk to the kids in places like Illinois, Ohio, Florida, and Louisiana, but you don't pull people off bread-and-butter recruiting regions to do it. You take your best shots at the kids who seem sincerely interested and leave the rest alone. (See both the late Marmie and Snyder years). There is a long six months ahead of us. Sure, I'll be keeping an eye on the baseball scores, and I'll try to catch all of the women's games in the NCAA tourney, but, like most Sun Devil fans, the vast majority of my attention is on the football program. In order to help pass time, I'm please to announce a new project that will unfold over the coming months: the naming of an All-time ASU team. The Sun Devils have a rich heritage, yet many fans are not well-educated in the legendary players. We'll be announcing the team position-by-position, and it will probably take a few months to get through the entire squad. I'd love to get your help in this process, so if you'd like to nominate some players, or if you'd like to write an article on one of the positions, please send me an e-mail. A few guidelines: first, this will be a true team, with the right number of players at each position. That means one halfback and one fullback for example. The defense will be a 4-3. Players will be evaluated based on their college career, not their pro performance, and extended careers will carry more weight. So while Derrick Rodgers' performance in '96 was one of the great single seasons in Sun Devil history, it's not enough for him to make the team. Players will be judged at the position they played in college, not the pros, so Darren Woodson will have to make it as an OLB, not a SS. Football performance will also outweigh off-field contributions or all-around popularity, so while Pat Tillman was without doubt one of the greatest men ever to wear a Sun Devil uniform, he wasn't necessarily one of the two best OLBs in ASU history. Some of the selections will be easy, others very difficult. Wish me luck! The Sun Devils ended their 15-game losing streak by beating No. 22 USC at home in front of a raucous student crowd, who stayed after the game to chant the players' and coaches' names. It's Herb Sendek's first ever Pac-10 win and ASU's first win over a ranked opponent since it beat Memphis in the NCAA tournament in March 2003. And ASU will not become the first basketball team in Pac-10 history to go winless in conference play. In other news, reports that Sendek is attempting to schedule all future home games on Sunday are not true. "Solid as rock and proud as a peacock, Appalachian State is HOT! HOT! HOT!" I officially drop all my complaints about Arizona State marketing. We're not doing so bad. Perhaps it can be said that Sun Devil football performances for the last few years had significant lapses in Sun Devil pride. Certainly, ASU needs to learn how to keep its swagger for every game, as opposed to selective games. In particular, the swagger of Sun Devil pride needs to appear consistently against nationally ranked football teams. It's a funny thing: American vocabulary. We can use the same words and have opposite meanings for those words. This issue of Sun Devil pride needs clarity, so that we can give recognition to the appearance of pride; and not a recognition of some cheap and illusory counterfeit. A case in point on this was the news conference of Omar Bolden. Did Omar show pride, or did he show foolishness through arrogance towards our opponents? Notice that the word "overly" has a boldness of font added in the first definition, and the word arrogant appears, as well. Arrogance: offensive display of superiority or self-importance; overbearing pride. Certainly. arrogance can lift the team from some of the levels of low pride displayed last season; but is it enough? Can a team have "self-importance" without an earned importance? Will such self-importance stand when the heavy adversity hits? Let's look at the second swagger definition. The words of arrogance and conceit do not appear. And yet, such swagger can truly come from performance in the face of adversity from ASU's opponents. 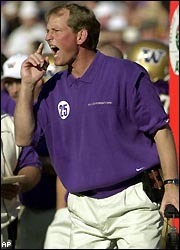 OSU, UW and SC are opponents, and swagger is certainly desired when one measures up to such opposition. So, did Mr. Bolden show an "overly self-assured" manner. Or, has he earned the gait of one who is certainly proud from past performances on the field. Perhaps, it's time to look at the following definition: Pride: the best of a group, class, society, etc. : This bull is the pride of the herd. Future Sun Devil swagger can come either from arrogance or from pride. Pride will be earned, as Omar Bolden has earned his press conference. Pride does not demean the opposition. It honors opposition as a measure of one's capabilities. Omar is obviously proud to be a Sun Devil, and simply removed the other candidates from view. He showed dramatic entertainment for the media and will continue to do so on Saturdays. Decades ago, there was a swagger in Tucson after an ASU loss found in the words, "Tempe, you choked!" A few years ago, there was a swagger as wildcat players danced upon the Sparky logo after earning the Territorial Cup. Pride would have honored the opponent, in this case ASU, showing the vanquishing of a team with strong ability. Demean that team, and the winning performance itself is demeaned by self-importance and conceit. Sun Devil Pride: That's what was shown in the team performances against U of A, since the day that they danced on Sparky. When the arrogant Cornhuskers swaggered into Tempe in 1996, they met up with the Sun Devil swagger. And may that Sun Devil swagger never be defeated from within by a cheap imitation, as has been demonstrated at times by those who are south of the Hassayampa!! While the effort was great and the outcome disappointing in last night's 67-61 loss to UCLA, I was more impressed with the 8,000 plus that turned out to support a team without a conference win. My fear was ASU would have this type of season considering the short-handed personnel, and our notoriously fickle fan base would abandon the program. But either the gutsy effort of the team or Sendek's recruiting pub or a combination of a lot of things have stabilized the gate. That's encouraging, because things should be getting better in a hurry. The addition of James Harden, Jamelle McMillan, Kraidon Woods, and Rihards Kuksiks should provide immediate help to ASU's flagging field goal percentage. More importantly, they will allow the coaching staff to better utilize young talent like Christian Polk. If Eric Boateng can provide minutes at center, it may free-up Jeff Pendergraph to fulfill more of a go-to role at power forward. It also means strong effort kids like PG Twi Anthuahene can provide support without having to do more than perhaps they're capable of. So if 8,000 can tolerate disappointments like last night, perhaps we can find another 4,000 to 5,000 who will come and watch a potentially deeper and more efficient team win a few more games next year. That would have to qualify as a major success for this program that was considered better left for dead before Sendek's arrival. A few people, including one commentator to this blog, felt Omar Bolden's TV tactics were over the top. Perhaps it didn't speak well of Bolden's character to play shuffle with team hats while holding back on the ASU hat. In defense of Bolden, the same scene was taking place on local and regional television stations all over the country, and has become par for the course since the first high school player who ever suckered a TV station to show up at his press conference. It's just the thing to do. Bolden was simply following form. Cockiness: Brash player for another team, especially a rival. Swagger: Brash player for our own team. Fans always gravitate to the new guy, but this will be especially true over the next few months as Omar Bolden quickly endears himself to Sun Devil Nation. I was waiting on SC forever. That's where I wanted to go. It was getting ridiculous. It got to the point where I wanted to hurt them. Please hurt them on Thanksgiving Day. Thanks to AStateAStateAState for the link! If anyone posts video of his signing day announcement to YouTube, please add a link to the comments. Wake up kids, it's Christmas! Sun Devil Law: no matter what, welcome each and every recruit today with open arms. Remember, they are signing their Letters-of-Intent today because they want to be Sun Devils. Don't worry about the kids that sign elsewhere -- why would we want them here if they don't want to be Sun Devils? Now, let's run downstairs and find what Santa left under the tree. Update: well, we found pretty much what we were expecting. A solid class capped by the addition of Omar Bolden. Before you get too excited or too disappointed, keep in mind that it's the 2008 and 2009 classes that really matter. "That's unfortunate. You expect with a program like (the University of Arizona), that's up and coming, right on the verge of making some noise on the national level, they would get some of these kids." If by "making some noise on the national level," he meant something that sounds like this, I might be in agreement with him. MapGameDay.com is planning to allow you to waste your time tomorrow in truly awesome fashion. Thanks to The Wizards of Odds via Deadspin for the link. Also, it looks like you'll be able to watch a webcast of the signing day press conference, although it's not clear whether this will be free, or for subscribers of The Sun Devils Sports Network only. When is an official site official? One of my pet peeves with the Athletic Department is their seeming inability to create a single, consolidated website. It seems like each part of the organization has their own site, and it makes it very frustrating for the humble Sun Devil surfer. First, of course, is the official site TheSunDevils.com. First off, I hate that URL. SunDevils.com was taken early in the days of the 'net, but now looks like it's available. Couldn't ASU claim that domain name as the copyright owner to the Sun Devils name? Next is Devil's Domain which requires a free registration. This then allows you to download the Devil's Domain Domain Communicator and Screensaver which is, essentially, a small application that provides links to articles from the official site. Not sure why this requires its own URL! Next up is The Sun Devils Sports Network which requires an insane $80 annual subscription. Heck, for $99 you can subscribe to ESPN GamePlan which offers about 100 times more content. You don't even get video of the football games for your eighty bucks, by the way. The fourth "official" site is Sun Devil Central, which is actually the most impressive of the bunch. It offers a nice choice of videos, wallpaper, posters, etc., and it's free. Last but not least is Answer The Scratch, which is the only site devoted to a specific sport (football). It will be interesting to see if Dennis Erickson keeps the ATS slogan from the previous regime. Again, quite a good site, but seems to overlap Sun Devil Central. So I'd love to know why these five URLs can't be combined into one or two sites. Anyone from the Athletic Department care to comment? Updated 2/7/07: apparently, one of the things you get for your $80 subscription to the Sun Devil Sports Network is "All Dirk Koetter radio shows" -- way to keep the site updated! Also, as well as football not being included, neither is men's basketball. Please explain how this subscription is worth $80 per year -- $30 or $40 would seem more reasonable. Updated 2/8/07: as another example of how badly priced this subscription is, one option offered is $10 per month for a handful of Olympic sports on video and audio of the two big sports. Meanwhile, for $13 per month, I subscribe to Sirius, where I get 100 stations of satellite radio 24/7 and every single NFL game. Please, ASU, re-consider your pricing. Well, in 48 hours the fax machines in Athletic Departments all over the country should start humming as high school kids start sending in their Letters of Intent. The NCAA mandates that this week is a dead period, so no more contact is allowed. Of course, some coaches believe these rules do not apply to them, and play pickup basketball with recruits despite the "no contact" rule. Despite my earlier proclamation that surprises never happen on LOI day, this year could be different. Expect a couple of additions to the latest list of commitments. It's impossible to really understand life as a college football coach on the recruiting trail. It's never simply a matter of contacting recruits and selling them on your school and program. It's really a low-grade game of cloak-and-dagger, and the stories coaches tell (years after, when the top secret status has been downgraded by time and graduation) would make you wonder about the sanity of it all. Consider the recruitment of John Jefferson, a story that has taken on a life of its own. Frank Kush once told a story about hiding Jefferson from late comers, and it has become bigger than life as it's been retold from booster to booster. If you believe the latest versions, Kush sent staffers to Jefferson's Dallas home, moved him to a hotel, and hid out until he signed his Letter of Intent on the first day he could (a day which we've come to know as the magical First Wednesday in February, and which will someday be recognized as a national holiday). Then there's the story of O.J. Simpson. ASU had him at the airport and had all but locked up the future superstar and, sadly, future social pariah. But back then, O.J. was just a blue-chip JC running back recruit in a full-scale tug of war between ASU and USC. As the story goes, an ASU assistant let O.J. go to the airport restroom where he was met by a USC recruiter who talked him into returning home on the sly. Of course, O.J. went on to star at USC and later in the NFL, with Buffalo as one of the all-time greatest running backs. Then there are the stories that seem of tantamount of importance at the time, but never really fit the test of time. For example, receivers coach Karl Dorrell left ASU for a similar job at Colorado. Dorrell was perhaps the key in-state recruiter for ASU, and was recruiting All-American receiver Kenny Mitchell. For a moment, Dorrell had turned Mitchell's head towards Colorado, but ASU reversed him at the last moment to get him to sign with ASU. It seemed like a huge recruiting coup at the time, but Mitchell waited nearly 4 years before displaying All-American skills, while less heralded recruit Lenzie Jackson became Jake Plummer's workhorse receiver during that era. There weren't many stories of this caliber under the Koetter era of ASU football because Koetter's staff took a very above-board approach to recruiting. They waited to evaluate recruits' senior seasons and more or less played in the pool of recruits that had yet to commit. They did not have a hard-sell agenda, and that appealed to some recruits, but probably resulted in a less-than-desirable annual yield. We should probably expect more of these types of stories under Dennis Erickson's staff. There seems to be a pirate flag flying over Tempe these days, and the staff appears willing to pump recruits hard -- committed or otherwise -- until the NCAA rings the bell on the season's recruiting. While nobody wants other coaching staffs to raid their own stockpile of commitments, it does seem to be a reality that to produce big-time results, you have to play by the standards of your opponents. That means taking whatever you can get, even if it means pilfering from another program's stash. In the meantime, it's probably not a bad idea to have a few cloak-and-dagger tricks and a hotel room or two to protect your own.